Cinco de Mayo is in just 6 days. 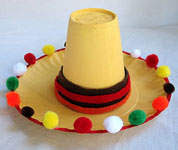 I love these simple crafts from Kaboose for mini sombreros and maracas. Make your own shakable maracas to celebrate Cinco de Mayo! Use your imagination to create colorful and festive maracas to enjoy with your friends. 1. Paint cups with tan paint and let dry. 2. Decorate cups by painting on swirling or curvy lines. We used red paint for ours. You can also paint zig-zags. We used white for ours. Paint the bottom of each cup red. 3. Place a handful of dried beans into one of the cups. 4. Put a layer of hot glue onto the rim of the cup with the beans in it before quickly placing the other cup on top of it, lining up the rims of both cups. Allow to dry completely. 5. 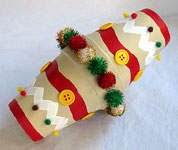 Finish any decorating you would like, such as adding pom-poms around the center (to hide the glue line). We also used mini pom-poms to dot the peaks of the zig-zags. 6. Once your glue is completely dry, shake your maraca! -Smaller children may enjoy using stickers instead of trying to manipulate pom-poms and buttons. Older kids may like to get even more intricate by painting on more detailed and thinner lines. -If you don't have any dried beans, use a few pennies instead. -Our color suggestions are just that, suggestions. Use whatever colors you like to make this project your own! These adorable little sombreros make fun table decorations for your Cinco de Mayo celebration! Make one or several for south of the border fun. 1. Paint paper plate and Styrofoam cup with sunflower paint. Let dry and repeat. Paint the outer edge of the plate rim red. Let dry completely. 2. Hot glue the Styrofoam cup to the center of the paper plate to form your hat. 3. Glue the brown felt around the bottom of the Styrofoam cup (the edge that is touching the plate) to make the hat band. Glue the red and orange felt over the brown to create stripes. 4. Glue the pom-poms to the red edge of the paper plate, alternating colors as you go (green, white, red, yellow, brown, orange, green, white, etc.). -If doing this craft in a group or classroom setting, break into two parts: painting one day, doing the remainder of the craft the next. -If you don't have a color paint similar to tan or "sunflower" on hand, make your own by mixing a little brown into some yellow paint until it is the color you desire. -Use any color of pom-pom you like. If you don't have all the colors listed here, simply use what you have on hand.